COLUMBUS, Ohio—When renowned explorer Richard E. Byrd returned from the first-ever flight to the North Pole in 1926, he sparked a controversy that remains today: Did he actually reach the pole? Studying supercomputer simulations of atmospheric conditions on the day of the flight and double-checking Byrd’s navigation techniques, a researcher at The Ohio State University has determined that Byrd indeed neared the Pole, but likely only flew within 80 miles of it before turning back to the Norwegian island of Spitsbergen. 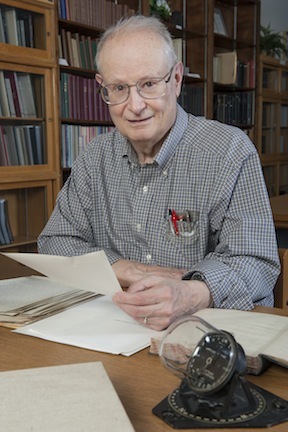 Gerald Newsom, professor emeritus of astronomy at Ohio State, based his results in part on atmospheric simulations from the 20th Century Reanalysis project at the National Oceanic and Atmospheric Administration (NOAA). The study appears in a recent issue of the journal Polar Record. “I worked out that if Byrd did make it, he must have had very unusual wind conditions. But it’s clear that he really gave it a valiant try, and he deserves a lot of respect,” Newsom said. At issue is whether Byrd and pilot Floyd Bennett could have made the 1,500-mile round trip from Spitsbergen in only 15 hours and 44 minutes, when some experts were expecting a flight time of around 18 hours. Byrd claimed that they encountered strong tail winds that sped the plane’s progress. Not everyone believed him. Newsom was unaware of the debate, however, until Raimund Goerler, now-retired archivist at Ohio State, discovered a flight journal within a large collection of items given to Ohio State by the Byrd family at the naming of the university’s Byrd Polar Research Center. In 1995, Goerler opened a previously overlooked cardboard box labeled “misc.” In it, he found a smudged and water-stained book containing hand-written notes from Byrd’s 1926 North Pole flight and his historic 1927 trans-Atlantic flight, as well as an earlier expedition to Greenland in 1925. Goerler looked to Newsom for help interpreting the navigational notes. “Given the strong opinions on both sides from people in the polar research community, we thought an astronomer who had no prior opinion about the flight would have the skills to do an assessment, and the neutrality to do it in an unbiased way,” he said. In fact, Newsom had helped teach celestial navigation during his early days as a graduate student, and still had an interest in the subject. With the help of current Byrd Polar archivist Laura Kissel, he pored over copies of the notebook and other related writings, including the post-flight report by Byrd’s sponsors at the National Geographic Society. Newsom was particularly curious about the solar compass that Byrd used to find his way to and from the pole. The compass was state-of-the-art for its time, with a clockwork mechanism that turned a glass cover to match the movement of the sun around the sky. By peering at a shadow in the sun compass, Byrd gauged whether the plane was heading north. Among the artifacts in the Byrd Polar Research Center is a copy of the barograph recording made during the flight, showing atmospheric pressure. A small calibration graph was labeled with altitudes for different pressures, allowing Byrd to determine how high the plane flew throughout the flight. Byrd used the altitude to set a device mounted over an opening in the bottom of the plane, and with a stopwatch he timed how long it took for features on the ice below to move in and out of view. The stopwatch reading then gave the plane’s ground speed. Byrd could then calculate the distance traveled, and know when he and Bennett had traveled far enough to reach the pole. He would also be able to tell if a crosswind was nudging the plane off course. And he would have had to repeat the calculations every few minutes for the entire trip north. The partially open cockpit would have been very loud, Newsom explained, so Byrd wrote messages in the book so Bennett could read his suggested course corrections. For example, there was a note from Byrd to Bennett asking for a three-degree correction to the west, to counter a crosswind. Changes in the atmosphere at different latitudes meant that Byrd’s calibration graph lost accuracy during the duration of the flight. Newsom calculated that this could have led Byrd to believe that he had reached the pole when he was still as much as 78 statute miles away, or caused him to overshoot the pole by as much as 21 statute miles. Next, Newsom decided to test whether Byrd could have experienced strong tailwinds as he claimed, and to do that, the astronomer turned to an unbiased resource of his own: NOAA’s 20th Century Reanalysis dataset. Using U.S. Department of Energy supercomputers, NOAA calculated likely atmospheric conditions all over the earth for every six hours between 1870 and 2010. The data used a computer model that calculated 56 plausible scenarios for every six-hour interval, and the results of the 56 model atmospheres were averaged together to arrive at the most likely conditions. The model winds did not appear consistent with what Byrd said, so Newsom examined each of the 56 scenarios individually, to see if even one of them allowed for strong tailwinds during the trip. They didn’t. It’s easy to forget, he continued, how difficult and dangerous navigation was before modern altimeters and GPS. Byrd was under a tremendous amount of pressure: he’d overloaded the plane with fuel to make sure he and Bennett wouldn’t run out over the Arctic (they would likely have died in that circumstance), but the extra load made the plane hard to control; he had to calculate the plane’s location constantly for nearly sixteen hours, in a screaming-loud cockpit while worried about frostbite; and partway through the trip, one of the plane’s engines sprang an oil leak and seemed likely to stop working. “That they returned at all is a major accomplishment, and the fact that they arrived back where they were supposed to—that shows that Byrd knew how to navigate with his solar compass correctly,” Newsom said. And, since the plane was theoretically high enough to see nearly 90 miles to the horizon, Byrd may not have reached the pole, but even in the worst-case scenario, he almost certainly saw it through his cockpit window.